The essence of Boulders lies in the tranquility and solitude of its desert location, in the warmth of sunrays, in the afternoon wind, whispering in the canvas of the safari tents. Tucked away in a cluster of granite rocks, in touch with the vast arid landscape, the Boulders camp reminded us just how important the choice of a hotel is to the travel experience. 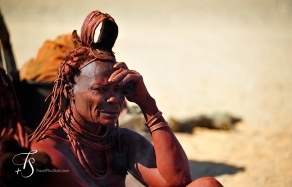 The Namib Rand Nature Reserve lies in an area where a vast mountain range halts the advancing Namib Desert, turning it into semi-arid plains. 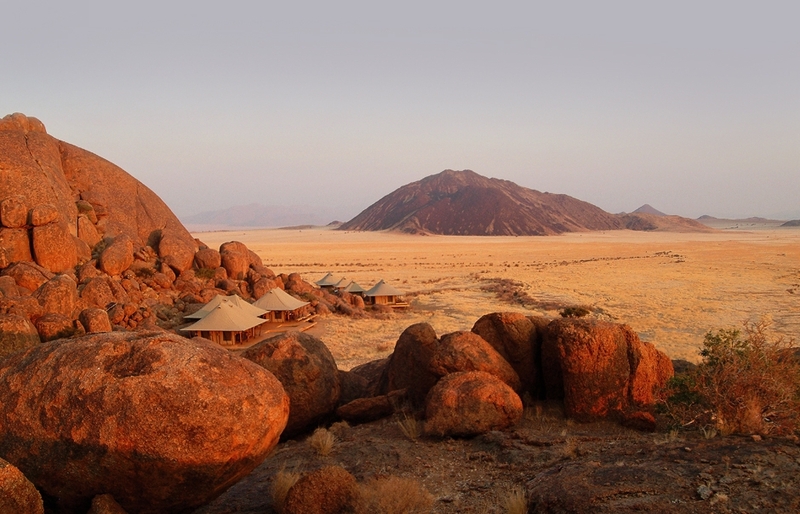 This is the setting for Wolwedans Boulders Camp. 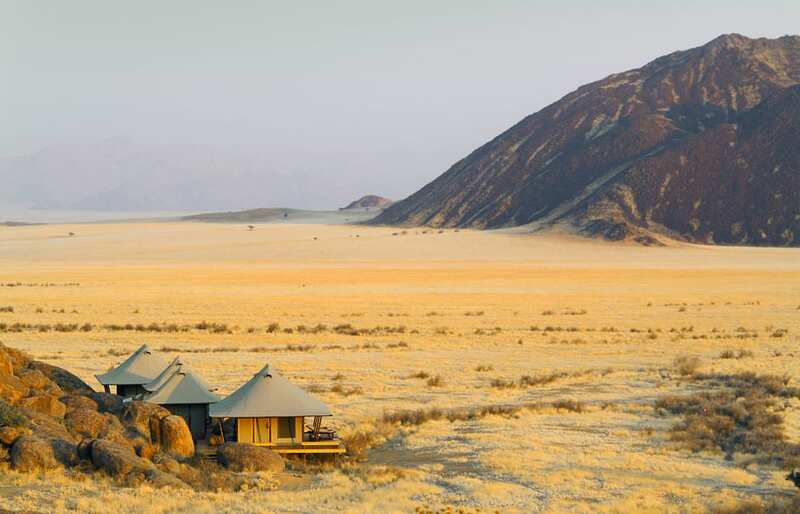 Surrounded by enormous granite rocks, the safari tents of the Camp face stark and dramatic landscape. 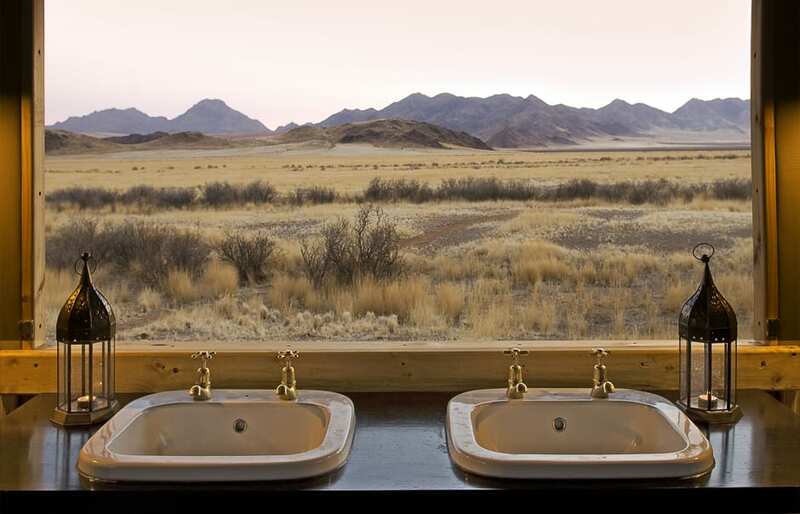 Combination of diverse landscapes and unique weather system, with morning mist being the only source of water, blesses this land with some of the most stunning sceneries in Africa—of which perhaps the most famous ones are the Sossusvlei dunes, just north of the Namib Rand. 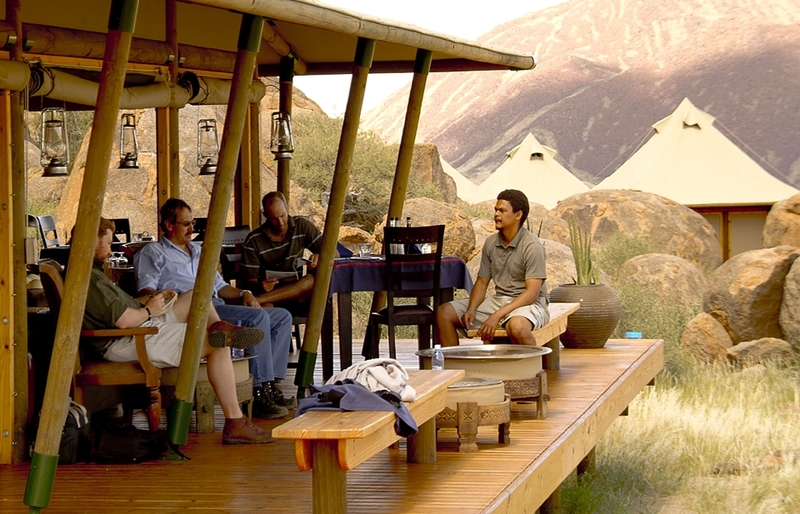 The reserve is home to a small portfolio of Wolwedans camps, set up in different surroundings. 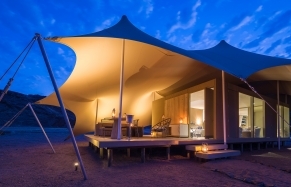 Among them the most remote and exclusive is the Boulders Camp, its four tents pitched in the southern part of the Namib Rand. Raised on wooden platforms and protected by peaked canvas roofing, the tents are accompanied by a dining and lounge tent with the kitchen sandwiched in between. A wooden deck joins the main area and leads to an open fireplace. And that’s about it: Boulders is a exclusive and cozy affair. 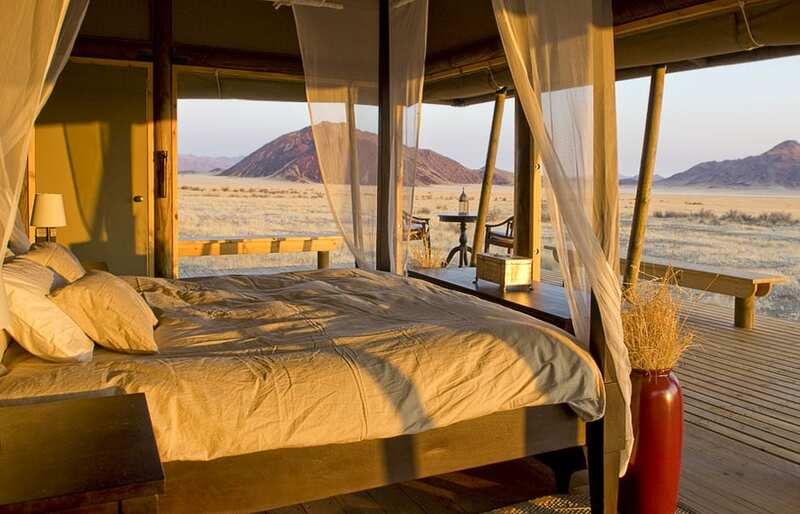 The tents are spacious, with a four-poster bed in the center, fitted with a mosquito net and sparse furnishings that include a small dressing table and a wooden storage chest. The canvas can be opened, inviting the surroundings in. A private bathroom is located in an adjacent, separate tent. Encompassing both is a raised wooden deck. 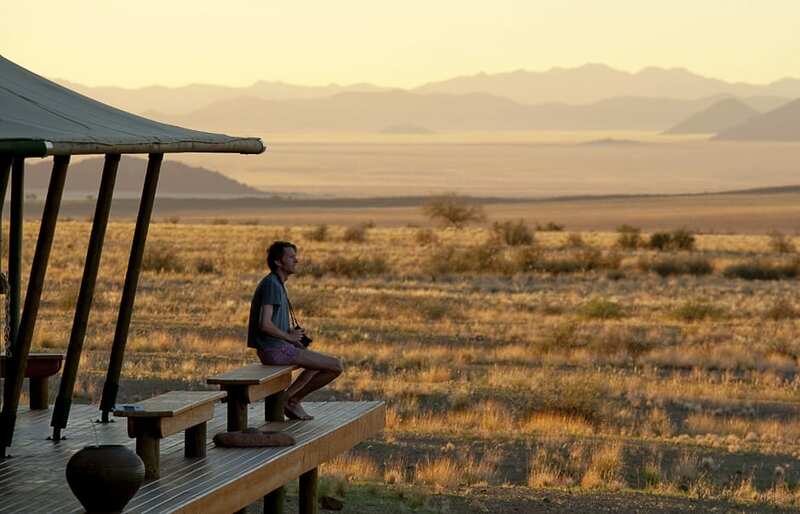 The camp does provide game drives, but seeing animals should come as a bonus—the stunning landscapes are the main draw. Sundowner drive is a must, so is a visit to the sunset spot on top of the huge rock overlooking the camp. The views from there are magnificent. For us the most important aspect of the Boulder experience was the excellent service, and exclusivity of the camp, with a very small number of staff ensuring a personal treatment. There were few other guests and we got lucky with a fantastic companion. In the end that’s what matters—after all “a journey is best measured in friends”. 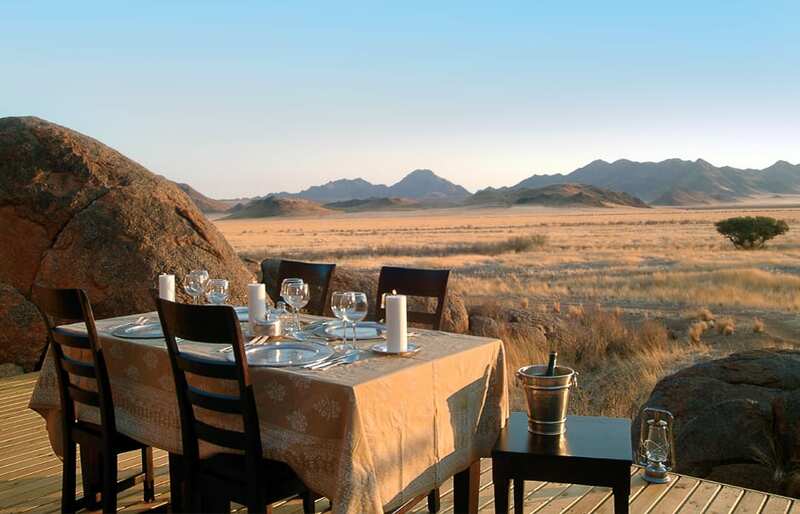 Our mantra at Travel+Style is that hotels are pivotal to the travel experience—and it applies to the Wolwedans Boulders Camp. The magical ambience, the beautiful setting and the warm, personalized service made our stay. Boulders is truly out of the ordinary—well deserving the Editor’s Pick. The scenic drives were a pure relaxation in the peacefulness of the reserve—and despite the arid conditions there was still plenty of game: oryx, springbok, ostrich, & zebra and plenty of birds (there are more than 100 bird species living in the area). The guides are excellent! There is no electricity in the tents other than to power some lights. Charging cameras and other devices has to be done in the kitchen area. If anything, the food was a tiny bit of a letdown—but only by comparison with the Dunes Lodge, where we also stayed. Still, dining is very high quality and beautifully presented.